The mission of Spirit of the Wild Horse is for the preservation and protection of America’s wild horses. Our goal is to bring awareness to the public for the need to reinstate federal protection, and provide sanctuary for the horses to live in freedom; without fear and harassment, in order for future generations to experience. 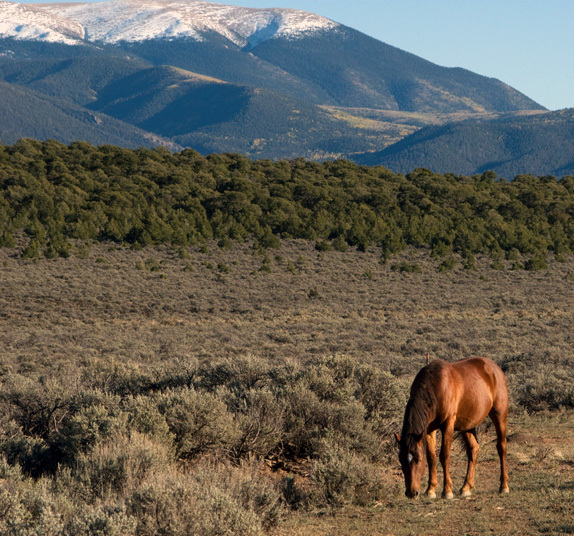 We envision long-lasting protection for the wild horses. Acquire permanent lands where they can live free in their natural environment and without competition. Where they are respected, honored and cherished by the American people. Spirit of the Wild Horse Organization is located on top of Wild Horse Mesa in Southern Colorado along the border with New Mexico. The mesa is home to 150 wild horses that come and go as natural instinct tells them to. The Organization began after an incredible friendship that developed between Judy and an injured mare, which she named Boots. On the very day Judy moved to the mesa, a stallion named Wind Spirit, brought a young, injured and starving Boots to her home and left her with Judy when the rest of the band had to move on with autumn approaching. Boots was not able to keep up with the other horses, but felt safe staying on the premises. She has been there everyday since July 4, 2004. 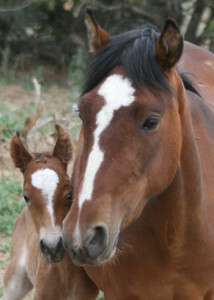 Under Judy’s love and care, Boots has thrived and her health improved enough that she has a beautiful colt, name Milagro, and is in a small band that lives on the 40 acres that Judy calls home. Purchase and release of wild horses captured by local ranchers. Thirty six horses released to date. Highway signs warning motorist of horses crossing. First two signs installed spring 2007 by CDOT. Public education and awareness of the Wild Horse removal and destruction. Winter feed and water when necessary. Development of a rental cabin on the Foundation property for people to experience the wild horses up close and generate additional revenue. Working with other wild horse sanctuaries in other states; Black Hills Wild Horse Sanctuary in South Dakota, The Cloud Foundation, Wild Horses Wyoming, and The New Mexican Horse Project. Merchandise (T-shirts, leather pillows, mugs, mouse pads, ceramic tiles, tables, cards, prints) has been created with Judy’s incredible photographic images of the wild horses with revenues from the product sales going to the Foundation. Judy Barnes has loved wild horses all her life and dreamed of having a sanctuary to place the horses rounded up and left in holding facilities. Her dreams have started to become a reality. Through her photography, she is bringing awareness to the predicament of the wild horse and the need for their protection.